As the variety of laparoscopic procedures used to diagnose and treat pelvic pain has increased, so has the variety of possible surgical complications. Transecting nerves to interrupt the transmission of pain carries 3 categories of risk: (1) risks associated with the performance of the procedure; (2) theoretical long-term undesirable side effects; and (3) risk of failure of the procedure to relieve pain. Laparoscopic uterine nerve ablation (LUNA) [1, 2, 3, 4, 5, 6] and laparoscopic presacral neurectomy (PSN) [7, 8, 9, 10, 11 12, 13] have been used to treat pelvic pain for many decades. PSN denervates the uterus and some bladder sensation, while LUNA may partially denervate the uterus. Recent studies indicate that the LUNA procedure does not add to the degree of pain relief achieved by laser vaporization of endometriosis  and is inferior to PSN in the long term treatment for uterine dysmenorrhea . The main surgical risk of LUNA is damage to the ureters. The ureters can be injured during LUNA if the procedure is performed too far laterally or if a uterosacral ligament is distorted by previous unsuccessful LUNA or endometriosis. Uterine blood vessels lateral to the uterosacral ligaments could be lacerated during a LUNA and a ureter could be damaged during efforts to coagulate such a bleeder. Suture repair of a bleeder might be slightly more precise but still puts the ureter in some jeopardy. Although the LUNA procedure is slightly easier than PSN, this alone is not sufficient justification for its use. PSN is the procedure of choice for midline pelvic pain and primary uterine dysmenorrhea. PSN is indicated for relief of midline pelvic pain syndromes that include what might be termed dysmenorrhea, uterine cramping with menses or away from menses, or midline pelvic pain. Lateral pelvic pain from an ovarian or tubal origin travels in nerves within the infundibulopelvic ligament, and such pain would not be expected to be relieved by PSN. Patients who have failed previous medical or surgical treatment of central pelvic pain are obvious candidates for PSN, although some of these patients may benefit simply from more aggressive excision of endometriosis. Should PSN be done as part of initial surgical treatment of midline pelvic pain or uterine dysmenorrhea? No incorrect answer exists to this question. Some surgeons recommend routine performance of PSN during laparotomy to excise the endometriotic tissue, while some recommend trying other measures first. No specific reason to withhold a potentially beneficial surgical procedure exists if a practitioner can perform the procedure and judges that the benefits outweigh the risks. In this type of clinical decision-making, the risk of complications will carry important weight. Laparoscopic electrosurgical PSN using an umbilical approach through a transverse peritoneal incision was developed in 1988 . The technique and results have been described in detail. This technique was later adapted for use with a carbon dioxide laser . Presacral neurectomy is performed on the anterior aspects of vertebral bodies L5 and S1 (Figure 1). Immediately adjacent vital structures that could be injured include the common iliac veins, the ureters, and the sigmoid mesentery. The patient is placed in a steep Trendelenburg position and rolled to the left, because this position helps to displace the sigmoid laterally. 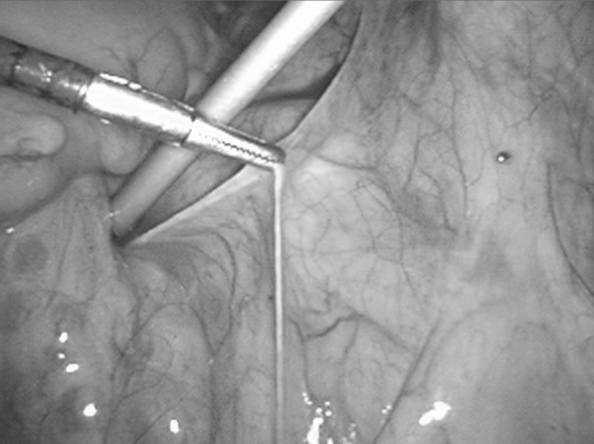 A blunt probe also retracts the sigmoid laterally, effectively removing the sigmoid from the operative site. Laparoscopic surgical anatomy as seen through an umbilical port. The sacral promontory (a) and sigmoid mesentery (b) are important and obvious landmarks. More subtle is the presence of the bifurcation of the vena cava (arrow) that is seen as a blue discoloration beneath the peritoneum. The dashed line demarcates the lower edge of the left common iliac vein. If presacral vessels are present, they typically cannot be seen beneath the intact peritoneum and underlying tissue. Damage to the left common iliac vein may occur during laparoscopic PSN. The risk of damage to the vein can be reduced by identifying its retroperitoneal location by the "waterbed sign." To elicit this sign, the peritoneum between the common iliac arteries is tapped with a blunt probe, and the location of large venous structures will be apparent by a bouncing retroperitoneal fluctuance, indicating the presence of blood under low pressure. Sometimes the retroperitoneal venous structures can be seen easily through the peritoneum, and the atrial pulsation will be visible, but it is still wise to elicit this sign. 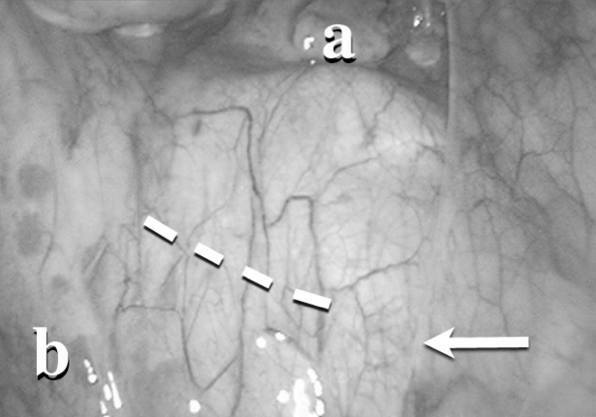 The peritoneum caudad to the vein is grasped, elevated (Figure 2), and incised transversely from the edge of the sigmoid mesentery on the left to the common iliac vessels on the right (Figure 3). Elevation of the peritoneum moves it away from any retroperitoneal vessels. The iliac arteries have thicker walls, are more resistant to damage, and generally are not near the presacral neural plexus. Thus, damage to the iliac arteries should be extremely uncommon. The sigmoid mesentery is retracted to the left and the peritoneum is grasped in midline and elevated away from underlying vital structures. The peritoneum is incised transversely, which is a simple way to help define the lateral margins of the dissection. After the peritoneum has been incised transversely from the edge of the sigmoid mesentery on the left to the area of the common iliac vessels on the right, the retroperitoneal anatomy is seen. 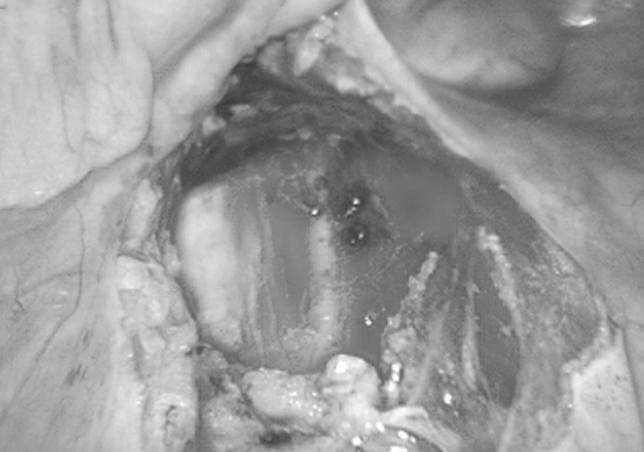 In this patient, the periosteum to the right of midline is visible without any dissection. To the left of midline, fatty tissue obscures the underlying anatomy. Between the fatty tissue on the left and the periosteum on the right lies the presacral plexus (asterisk). One concept that can increase the risk of damage to either ureter during a PSN is the notion that a PSN is properly performed "from ureter to ureter." This errant notion has no basis in the published literature [16, 17, 18, 19, 20, 21, 22, 23, 24] or anatomy books, because the presacral neural plexus is located in midline or just slightly to the left of midline. It is not necessary to identify the left ureter during a PSN. The left ureter is hidden beneath the mesentery of the sigmoid colon and actually lies lateral to the mesentery. The left ureter can be seen with difficulty only if the mesentery is retracted far laterally. Thus, if the left ureter is visible from the operative field, the dissection has been carried too far to the left. Dissection to try to find the left ureter to avoid damage to it risks damage to the vessels of the mesentery. Because the neural fibers of the presacral plexus are located between the common iliac vessels, the dissection during a PSN should not usually come to lie near the left ureter. 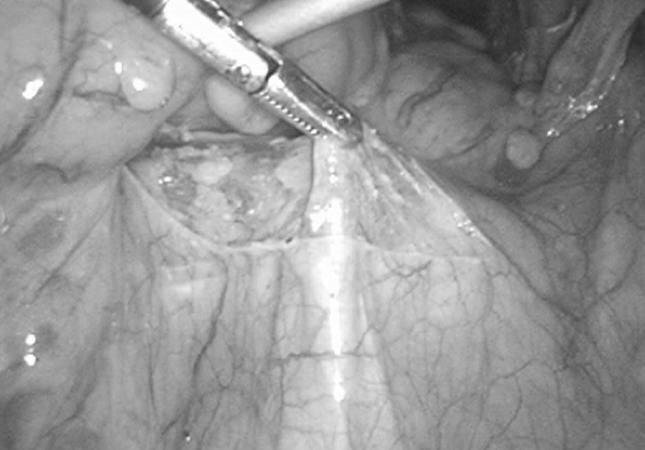 Blunt dissection is used at each angle of the peritoneal incision to create windows exposing the periosteum (Figure 4). This also helps to define the position of the common iliac veins.The next step is to grasp and elevate the presacral tissue (Figure 5) and transect it in successively deeper layers until the full thickness of the presacral plexus has been severed (Figure 6). As this transection proceeds, sizable presacral vessels may come into view, which were initially hidden by the retroperitoneal tissue. Because the presacral plexus passes anterior to these vessels, it is not necessary to transect any vessels and expose bare periosteum if the tissue anterior to the vessels is removed. Blunt dissection is then used to peel the presacral plexus off the underlying periosteum and any presacral vessels. The overlying distal peritoneum is stripped away, the plexus is transected caudally, and the specimen removed (Figure 7). The sigmoid colon lies just beyond the caudal peritoneal edge and could potentially be injured during final transection of the plexus if care is not taken. 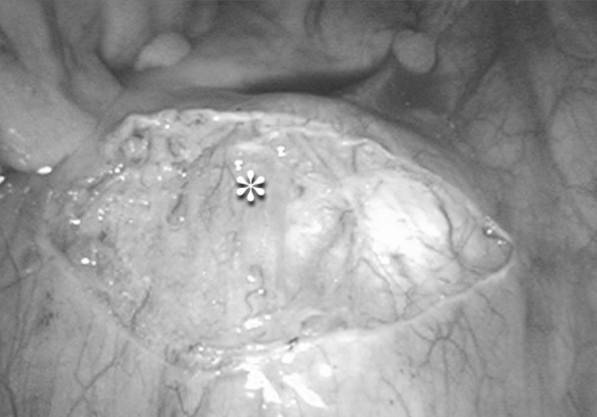 PSN is most safely performed with some type of contained surgical energy, such as electrosurgery or sharp dissection, rather than surgical energy with overstrike potential, such as CO2 laser vaporization or argon beam coagulator, which can increase the chance of injury to underlying vital structures unless an adequate backstop is used. Blunt dissection through the fatty tissue to the left of midline exposes the periosteum and isolates the presacral tissue. The presacral tissue bundle is grasped and elevated away from the underlying vital structures and is transected proximally near the cut edge of the peritoneum. Fatty tissue and small lymphatic channels may lie in the tissue bundle, and these can be transected without harm. 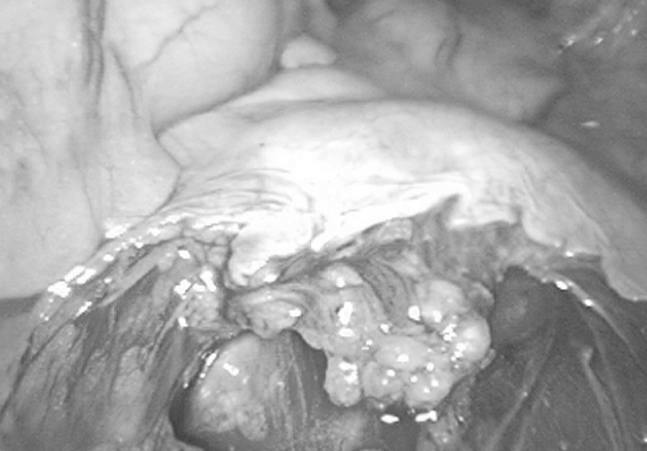 In some patients, a single nerve bundle may be apparent during and after transection of this tissue bundle, while in other patients, only wisps of tissue may be apparent. After the presacral bundle has been transected, the nerve tissue will lie amidst areolar fatty tissue. The cut tissue is grasped and bluntly dissected off of the underlying periosteum and small presacral vessels until the sacral promontory is reached. The distal cut edge of peritoneum is then grasped and the presacral bundle is stripped from this distal overlying peritoneum and then transected distally. After completion of a presacral neurectomy, the sacral promontory is more clearly seen. A medium-sized presacral artery is located in midline in this patient. The vascular anatomy of the prevertebral space is variable. It is not necessary to close the peritoneum. In over 440 laparoscopic presacral neurectomies performed by the author, 1 patient required repeat laparoscopy to evaluate continuing postoperative pain. A small hematoma was found in the presacral space that was evacuated and the patient recovered uneventfully. No cases of injury to the bowel, ureter, or great vessels have occurred [8, 13]. The anatomy of the great vessels of the anterior surface of the vertebral bodies is somewhat variable. In most patients, the bifurcation of the vena cava lies cephalad enough that neither it nor the left common iliac vein is directly in the area of surgery. In some patients, the bifurcation of the vena cava will lie more caudad and therefore at some increased risk. The left common iliac vein may be somewhat empty of blood and collapsed with the patient in a steep head-down position and thus may be rather transparent. It could therefore be damaged if not sought for and identified by atrial pulsations, which will be more obvious with positive thoracic pressure during ventilation. The presacral vessels are quite variable in their anatomy. Some patients have essentially no presacral vessels, while others may have rather sizable presacral arteries or veins. If the left common iliac vein or bifurcation of the vena cava is injured, the pneumoperitoneum may initially tamponade a small hole. This may allow some very skilled surgeons to suture the defect. The intravenous pressure may be lower than the pressure of the pneumoperitoneum, which theoretically might promote carbon dioxide embolism. Most surgeons would do well to consider enlarging the umbilical incision to perform a repair by mini-laparotomy. If presacral vessels are damaged, the site of damage should be observed to determine whether laparoscopic attempts at repair might risk damage to the left common iliac vein or bifurcation of the vena cava. Bipolar or monopolar coagulation will control most small bleeders. A figure-eight suture passed through the periosteum and remnant presacral tissue may be helpful in other cases. Staples or thumbtacks passing into the vertebral body may rarely be necessary to control bleeding. Long-term complications with PSN are uncommon. An occasional patient will report alteration of the sensation of bladder fullness due to interruption of sympathetic fibers carrying bladder sensation.These patients seem to urinate normally, do not have increased urinary infections, and are not incontinent. Some patients may report a decrease of vaginal lubrication with sexual arousal. Constipation is not a predictable consequence of presacral neurectomy because the parasympathetic fibers that stimulate evacuation of the rectosigmoid pass through the inferior hypogastric plexus (also termed the pelvic plexus) and are not interrupted by PSN. Despite this, some authors have noted an incidence of constipation of between 25%  and 37% . Some sympathetic fibers to the sigmoid may be transected by PSN, but the action of these nerves is to slow intestinal action and severing the nerves would be expected to decrease constipation scores, as has been noted . In patients undergoing laparoscopic PSN, follow-up observation has shown evidence of long-term efficacy [7, 9, 11, 12, 13] similar to that seen after laparotomy PSN [21, 22]. Failure of a PSN to relieve pain may be due to misidentification of the source of pain. While the term "dysmenorrhea" may imply uterine cramping to some clinicians, it may imply more generalized pelvic pain to others. Because estrogen receptors are present in blood vessels and bowel walls, some pain during menses may originate from areas other than the uterus. Patients, too, could misinterpret where their sensations of cramping are coming from. Alternate causes of pain, such as intestinal cramping or interstitial cystitis, should be considered in the differential diagnosis. Identification of the source of pelvic pain is a clinical art. Sometimes questioning the patient may be helpful. For example, if a patient says that her pain during menses is "just like being in labor," this might more strongly indicate a uterine source of pain. Uterine pain can also radiate into the back apparently through the uterosacral ligaments, down the anterior thighs apparently through the round ligaments, and up to the umbilicus perhaps through the urachus or simply because the pain seems spreading and all-encompassing. Terms such as "dysmenorrhea" or "midline pelvic pain" may not be familiar to the patient, and the clinician must expend effort in determining the nature of the patient's pain as accurately as possible. Pelvic examination can help determine the source of pain. Clinicians interested only in the size and position of the uterus and ovaries are ignoring valuable information. The uterus should be palpated between the fingers of the external and internal hands to see if compression of the uterus reproduces some part of the patient's pain. If so, then a PSN may help. Uterine retroversion may make determination of uterine tenderness difficult or impossible. Following this, the external hand should be placed behind the examiner's back and the cul-de-sac and uterosacral ligaments should be lightly stroked while watching the patient's face. Endometriosis in these locations will cause most patients to wince their face in pain, and many will arch their back or move up the table and away from the examiner because of the pain. This type of pain is easily relieved by excision of endometriosis from those areas. Even if endometriosis is not found, if the areas noted to be tender on office pelvic pain mapping are excised, many patients will get pain relief even though the pathology report may be negative. A more direct office test is the sound test of Browne . A sterile uterine sound is passed through the cervix and into the uterus, and the patient is asked to comment on whether any resulting pain resembles pain she experiences during menses or at other times. If so, then this would imply that the uterus is the source of at least some of the pain and PSN may be helpful. A beneficial effect of presacral neurectomy on urinary urgency has been anecdotally noted by the author in a few patients, some with a provisional diagnosis of interstitial cystitis. Modern laparoscopic presacral neurectomy is a simple, rapidly performed procedure that has few negative side effects and has published evidence of efficacy. Proper surgical technique can keep the risk of surgical complications extremely low. Feste J. Laser laparoscopy. J Reprod Med. 1985;30:413-417. Daniell JF. Laparoscopic evaluation of the KTP/532 laser for treating endometriosis - initial report. Fertil Steril. 1986;373-377. 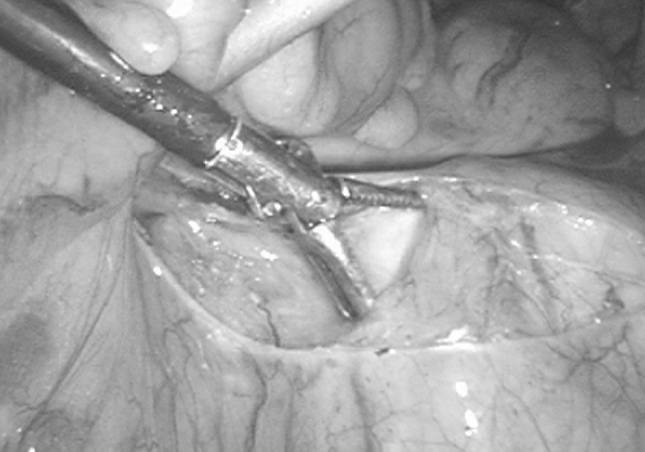 Lichten EM, Bombard J. Surgical treatment of dysmenorrhea with laparoscoicuterine nerve ablation. J Reprod Med. 1987;32:37- 41. Sutton CJG. Laser laparoscopic uterine nerve ablation. In: Donnez J, ed. Operative Laser Laparoscopy and Hysteroscopy. Louvain, Belgium: Nauvelaerts;1989:43-52. Corson SL, Unger M, Kwa D, Batzer FR, Gocial B. Laparoscopic laser treatment of endometriosis with the Nd:YAG sapphire probe. Am J Obstet Gynecol. 1989;160:718-723. Gurgan T, Urman B, Aksu T, Develioglu O, Zeyneloglu H, Kisnisci HA. Laparoscopic CO2 laser uterine nerve ablation for treatment of drug resistant primary dysmenorrhea. Fertil Steril. 1992;58:422-424. Perez JJ. Laparoscopic presacral neurectomy. Results of the first 25 cases. J Reprod Med. 1990; 35:625-630. Redwine DB, Perez JJ. Laparoscopic presacral neurectomy. In Soderstrom RA, ed. Operative Laparoscopy. The Masters' Techniques. 2nd ed. New York, NY: Raven Press; 1998:175-181. Nezhat C, Nezhat F. A simplified method of laparoscopic presacral neurectomy for treatment of central pelvic pain due to endometriosis. Br J Obstet Gynecol. 1992;99:659-663. Daniell JF, Kurtz BR, Gurley LD, et al. Laparoscopic presacral neurectomy vs neurotomy: use of the argon beam coagulator compared to conventional technique. J Gynecol Surg. 1993;9:169- 173. Biggerstaff ED, Foster SN. Laparoscopic presacral neurectomy for treatment of midline pelvic pain. J Am Assoc Gynecol Laparosc. 1994;2:31-35. Perry CP, Perez J.The role for laparoscopic presacral neurectomy. J Gynecol Surg. 1993;9:165-168. Redwine DB, Perez JJ. Pelvic Pain Syndromes. In:Arregui M, Fitzgibbons R, Katkhouda N, McKernan JB, Reich H, eds. Principles of Laparoscopic Surgery: Basic and Advanced Techniques. New York, NY: Springer-Verlag; 1995:545-558. Sutton C, Pooley AS, Jones KD, Dover RW, Haines P. A prospective, randomized, double-blind controlled trial of laparoscopic uterine nerve ablation in the treatment of pelvic pain associated with endometriosis. Gynaecol Endosc. 2001;10:217-222. Wilson ML, Farquhar CM, Sinclair OJ, Johnson NP. Surgical interruption of pelvic nerve pathways for primary and secondary dysmenorrhoea. Cochrane Database Syst Rev. 2000;(2):CD001896. Meigs JV. Excision of the superior hypogastric plexus (pre- sacral nerve) for primary dysmenorrhea. Surg Gynecol Obstet. 1939;68:723-732. Phaneuf LE. Presacral neurectomy in intractable dysmenorrhea. J Mt Sinai Hosp. 1947;14:553-555. Browne OD.A survey of 113 cases of primary dysmenorrhea treated by neurectomy. Am J Obstet Gynecol. 1949;57:1053-1068. Freier A. Pelvic neurectomy in gynecology. Obstet Gynecol. 1965;25:48-55. Malinak LR. Operative management of pelvic pain. Clin Obstet Gynecol. 1980;23:191-200. Polan ML, DeCherney A. Presacral neurectomy for pelvic pain in infertility. Fertil Steril. 1980; 34:557-560. Lee RB, Sonte K, Magelssen D, Belts RP, Benson WL. Presacral neurectomy for chronic pelvic pain. Obstet Gynecol. 1986;68:517-521. Tjaden B, Shclaff WD, Kimball, Rock JA.The efficacy of presacral neurectomy for the relief of midline dysmenorrhea. Obstet Gynecol. 1990;76:89-91. Candiani G, Fedele L, Vercellini P, Bianchi S, DiNola G. Presacral neurectomy for the treatment of pelvic pain associated with endometriosis: a controlled study. Obstet Gynecol. 1992; 167:100-103.